Everything you thought you knew about smart commuting and exciting riding is about to change. Taking advantage of Suzuki's advanced technology, the compact Burgman 200 ABS* has everything you need and more. The liquid-cooled, fuel injected, SOHC engine is tuned for optimal performance at the low- and mid-range revs used most for commuting and exploring around town. Smooth is what you feel. Quiet is what you hear. And power and fuel efficiency are your rewards. Plush double-stitched seating and specially designed cutaway floorboards provide comfort second to none. The Burgman also features a huge storage compartment large enough for two full-face helmets. 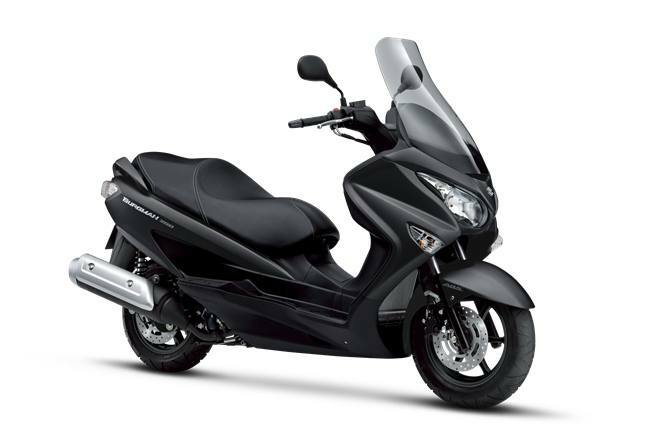 From its sleek Metallic Matte Black bodywork and aerodynamic windscreen to its smooth and powerful 200cc engine, the Burgman 200 ABS is the smart choice for scooters. New Metallic Matte Black color combined with sculpted dual tail lights defines Suzuki's distinctive craftsmanship. Eco Drive indicator educates you on the best way to ride your Burgman for maximum fuel economy.• The Eco Drive indicator does not automatically improve fuel economy but may help riders refine their riding efficiency and improve fuel consumption. Fuel consumption may vary depending on conditions such as the frequency of starts from stop, distance driven, rate of acceleration (throttle use), chosen speed, and maintenance. Dash-mounted maintenance alert reminds you when it's time for service. 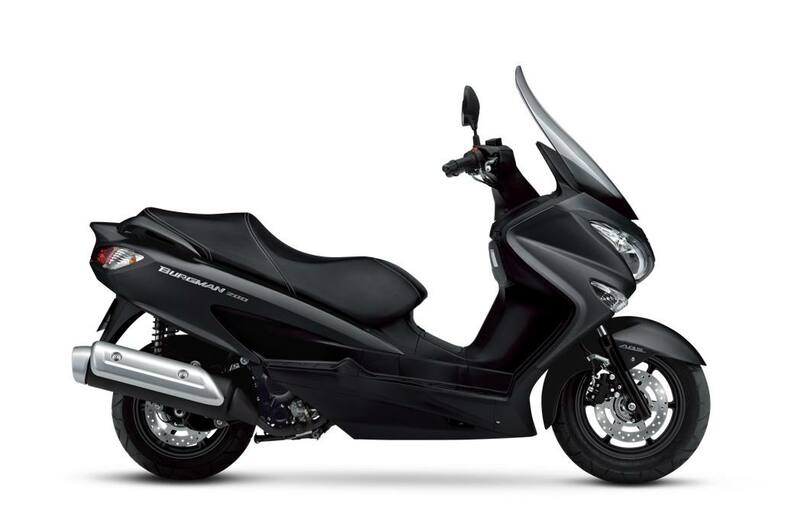 The telescopic oil-damped forks in the front and swingarm-style rear suspension make the Burgman 200 ABS' ride sporty and smooth. Spacious under-seat storage can hold two full-face helmets or large cargo bags and extras. Convenient light automatically illuminates the luggage space.• Helmet sizes and shapes vary, so some helmets may not fit in the under-seat compartment. Stylized Suzuki “S" 3-D emblems on the front leg shield and the upper meter panel denote the quality and sophistication of the brand.